In 1971, Doug Mew became the first person on record to swim the infamous Rip. This is him setting off from Point Lonsdale beach on a winter day in June! Close to shore the waters are moving. There are no designated swimming lanes, no designated distance. A group of swimmers are standing barefoot on the cool sand at Point Nepean. They are looking at twenty-five cubic kilometres of open water. A light breeze brushes against their bodies and before them is one of the most dynamic and challenging open-water swims in the world. On the horizon, three thousand metres away, is the Point Lonsdale lighthouse. The destination swim has a history. The first person on record to conquer it was the late Doug Mew in 1971. After that, crossings were few and far between and always frowned upon by the authorities. The Brighton Icebergers organised several groups and there were even a few double-crossings. These pioneers and others; wise and foolish, lucky and unlucky – have educated today’s swimmers and event organisers about one factor: that swimmer safety is paramount. Success depends on swimmers and crews working as a team in an aided swim. The coast and bay here are rugged. Vast volumes of water must pass through the 3km gap in the Port Phillip Heads at the change of tide. That water has to travel fast. Depths in the bay vary from one to one hundred metres. The wind brings tides in from Bass Straight, too. These often run in the opposite directions to tides leaving the heads – creating turbulent swells, eddies and whirlpools. This is notorious shipwreck territory. Even if they look calm, conditions can be wild. They are heading for the critical slack tide in the channel. It lasts for twenty minutes. At this distance from shore the waters are cooler. During a gap in the shipping traffic the swimmers push through, guided by their crews. To mitigate risk they have agreed to swim in tight bunches and to be vigilant about taking directions from the support boats. If the crew say stop, the swimmers must stop. In 2013, one group had to tread water for ten minutes and watch while, within one hundred metres, a container ship three-stories high steamed past. While waiting they saw a seal coming up from the depths, perhaps wondering what they were doing there. 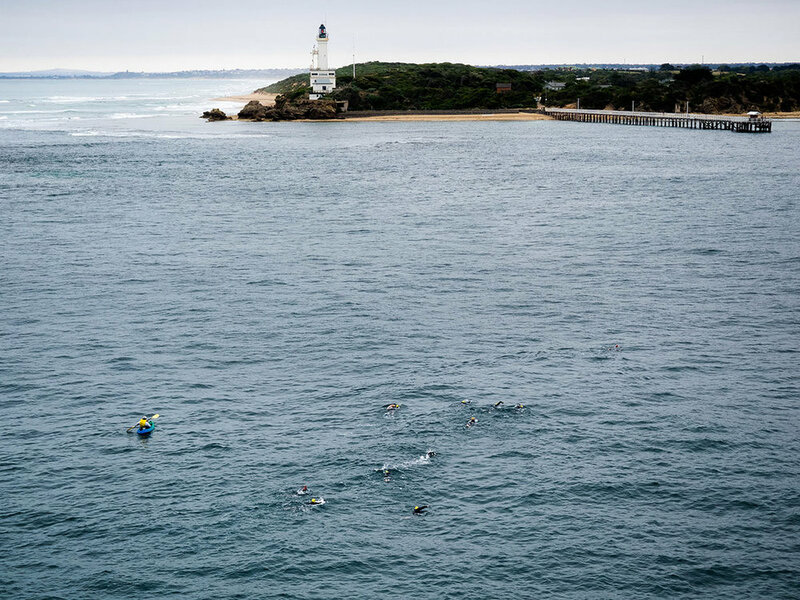 But crews or not, all swimmers feel the pressure of the tide against their bodies, both in the deep unpredictable waters of the channel, and on the way into shore. If history has taught these swimming teams anything it is this: don’t underestimate "The Rip". Even in this final stretch the swimmers are immersed in unpredictable elements. 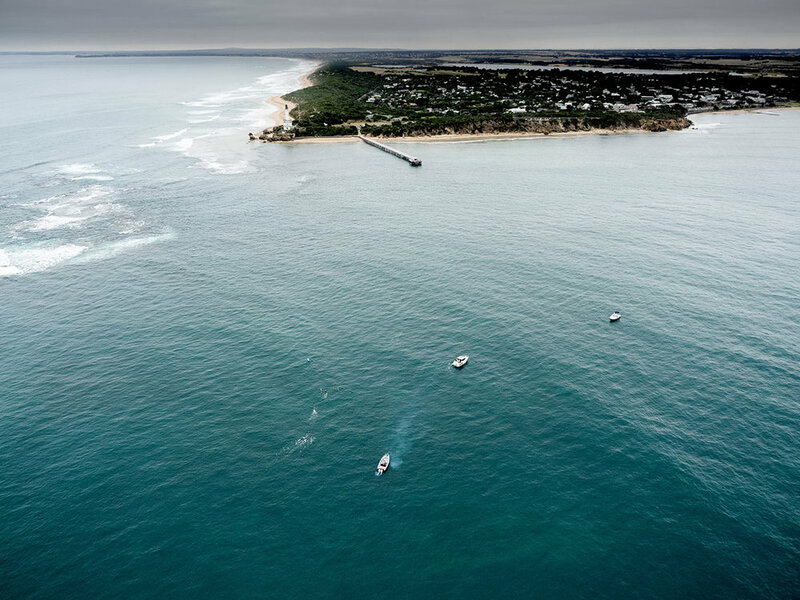 The last section of the swim into Point Lonsdale beach is a diagonal contest with the strong incoming current. Landmarks come into focus. The Point Lonsdale lighthouse shines in the sun. Light coloured sand, seaweed, and marine life can be seen and what may have seemed brazen is now within reach. The swimmers remain focussed, pushing home. The battle with the current is not yet over. Not until they stagger onto the beach. Then, as the endorphins emerge, some may be tempted to look back at Point Nepean. They may observe that the waters appear the same. But conditions have changed. The tide is moving faster. To swim this body of water now would be virtually impossible. What was courageous has become dangerous. What was exciting has become foolhardy. With "The Rip", timing is everything.